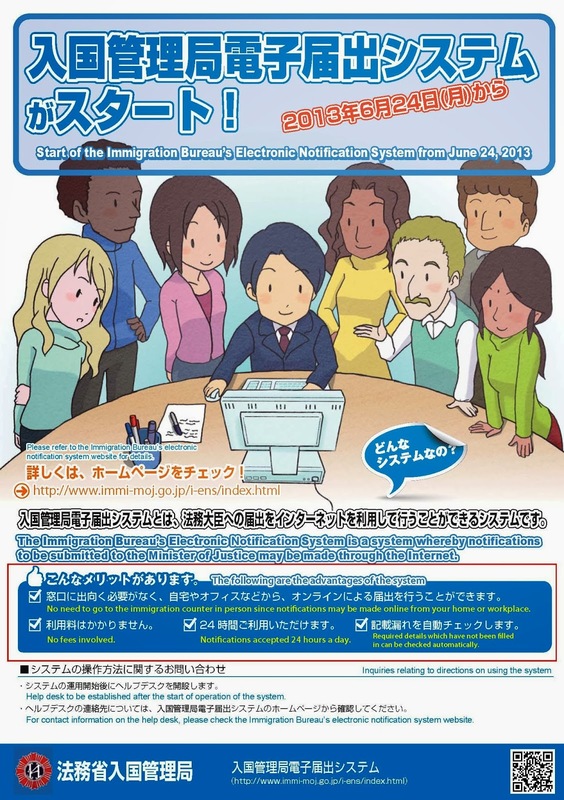 Under Japan's recently revised immigration laws, foreign residents of the country are explicitly instructed to inform the Ministry of Justice Immigration Bureau of any changes to information they've registered with the bureau. For example, when you change jobs or get a divorce, you're now required to notify the immigration bureau and can face penalties for failing to do so. To ease the burden of these notifications, the Immigration Bureau has established an online notification service that allows foreign residents to log in and submit many (but not all, as we'll see) of the legally required notifications without making a time-consuming and, for some, costly visit to the nearest regional or branch office. First off, you can access the system from the official Immigration Bureau e-Notification System Login Page. There are two login options: The first is for "mid- to long-term residents" of Japan. With the notable exceptions of foreign diplomats and "special permanent residents", that includes all foreign residents of the country who are not on tourist visas. If you're in Japan on a landing permission (a.k.a. "visa") meant for work (teaching, running a business, practicing medicine, transferred by your company to an office in Japan, etc. ), study, research, or if you are on a spousal visa, this is for you. The other login option is for employers of such foreign nationals. Though their participation is not required by law, they are strongly encouraged to report relevant changes of their foreign employees. When reporting a change of employer, the Immigration Bureau will determine if your new work responsibilities and employer are compatible with your current status of residence. If they are not, you will be required to apply for a change in status of residence (在留資格変更). The online system is not mandatory, and all of the above notifications can still be made in person at an immigration office. On the other hand, other changes of status that require notification, such as a change of surname or a change of reported nationality, must be made in person at an immigration office. Changes of home address must also be reported, but notification for a change of home address should be made directly at the municipal office (市役所, 区役所, etc.) that has jurisdiction over your new place of residence. The MOJ Immigration Bureau's e-notification system is not an option in these cases. The reports themselves are mandatory by law for all applicable residents who have had their last landing permission, change of status of residence, or extension of status of residence issued anytime after July 9, 2012. (So, the law is phasing in now and will eventually apply to all "mid- to long-term foreign residents".) Failing to make a necessary notification within 14 days of an applicable change in situation can be penalized by a 200,000 yen (~$2000 USD) fine, and knowingly reporting false information in a notification made to the Immigration Bureau can be penalized by a 200,000 yen fine or 1 year imprisonment.